After enjoying participating last in Vegan MoFo. I have decided to do it all over again. For those of you who are not familiar with Vegan MoFo, it is short for 'Vegan Month of Food'. Hundreds of vegan and vegan-friendly bloggers (like mine) sign up to commit to posting at least 20 posts in the month relating to vegan food. Many of you will know that I am not a vegan, but a vegetarian, however a lot of what I do cook from scratch happens to be vegan friendly. Therefore, September 2014 this blog will be free of all animal products such as cheese, dairy, eggs and honey. I do not have a theme for Vegan MoFo, but if there was going to be a theme it would be seasonal vegetables, of course and I might even throw in some recipes inspired by my Welsh roots too. 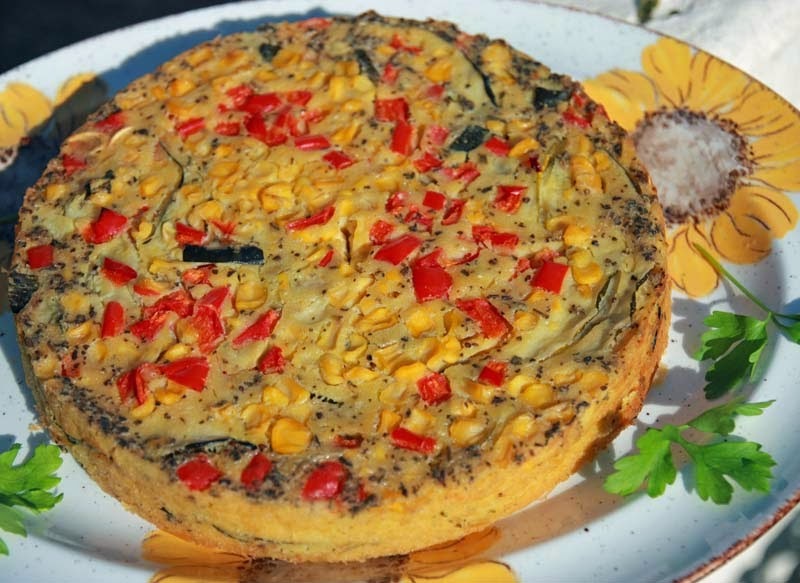 So let it begin with this family and crowd friendly vegan Sweet Corn, courgette and Red Pepper Savoury Cake. 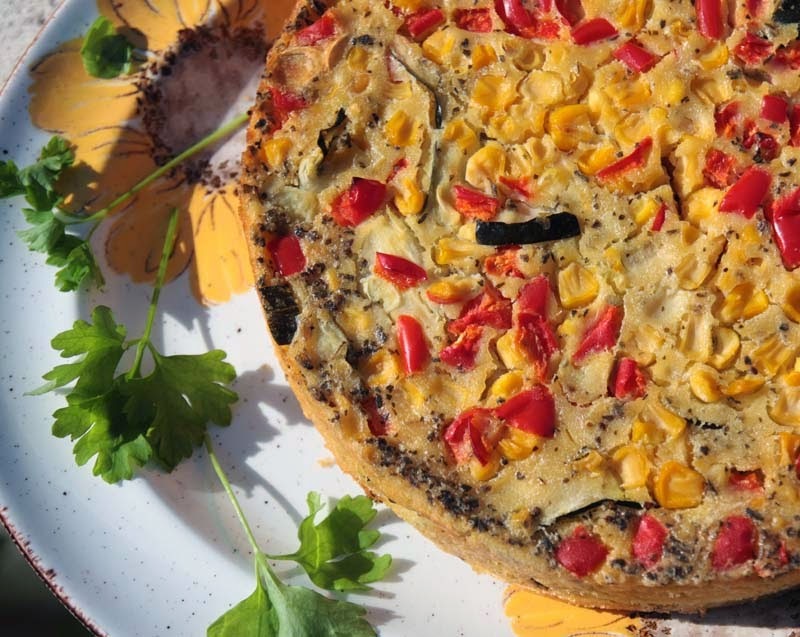 I made this savoury chickpea cake at the weekend, it was sliced and served with vibrant leafy greens. Coat the cake tins with oil and set aside. In a large bowl, whisk together the chickpea flour, water, oil and salt. Whisk well ensuring that there are no lumps in the batter. Then stir in all the vegetables, herb and seasoning and stir well to combine. Using a ladle, evenly pour out the thick vegetable batter mixture between the two tins. Put onto a baking sheet and transfer to a preheated oven gas mark 4/180oc for 25 - 30 minutes or until firm to the touch. Remove from the oven and allow to cool for 20 - 30 minutes, before removing from the tin and serving in slices. Inspired and adapted from Krys from Dine In, Not Out via this recipe. Great recipe - like you I'm not vegan but we eat a lot of vegan food - I'm going to give this a try. thank you freerangegirl, it's so lovely to hear from you. 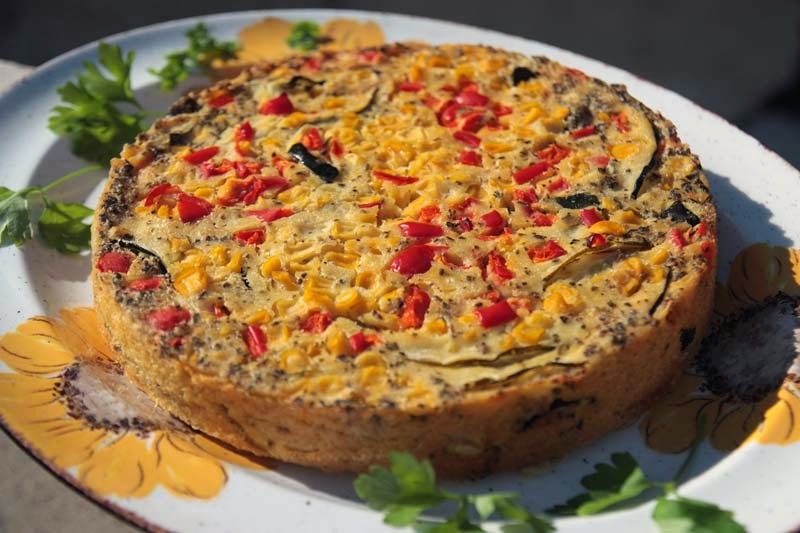 Ooh, I've never tried a savoury cake before - this looks wonderful! Thank you littleveganbear, you try a variation some day soon. This looks AMAZING! I love chickpea flour-based goodies. I love the beautiful colors. Seasonal produce is my scene too. I look forward to your posts! Thanks jasmine. I will be coming by your space too. Great looking cake Shaheen! Love the use of chickpea flour!